Tuscany is renowned for its wine, from classic Chianti’s to Super Tuscans to refined vintages from Bolgheri; a trip to this region of Italy wouldn’t be complete without exploring the array of bottles on offer. And when visiting Florence, there are a number of venues in which to enjoy exquisite local wines, ranging from the authentically rustic to the truly sophisticated. Below are five venues worth a visit for wine lovers when in the Tuscan capital. This quaint yet contemporary space in San Niccolò has been in the Navari family for over 20 years. Once a delicatessen, in 2009 it was refurbished by Alberto Navari to be a unique wine shop, bar, and open-plan restaurant: steel stools line a long bench overlooking a galley kitchen; crisp white shelves filled with wine, oils and aged balsamic vinegar, give this space a Tuscan feel, yet the décor has a modern twist. Grab a seat by the shop-front window overlooking via San Miniato to enjoy a crisp wine whilst watching the locals and travellers head towards famed lookout Piazzale Michelangelo. Should you feel peckish, Alberto’s Italian mother, Giuseppina, creates flavoursome dishes from the kitchen producing classic family recipes handed down through the generations. An elegant and yet peaceful bar set by the Ponte Vecchio, Caffe Dell’Oro opened last year as part of the Portrait Hotel, run by the Ferragamo family. Its clean lines, plush gray furnishings and sleek bar make this an ideal place to enjoy a pre-dinner wine (there is an adjoining dining room) or for a post-Uffizi wind-down drink as the gallery is nearby. 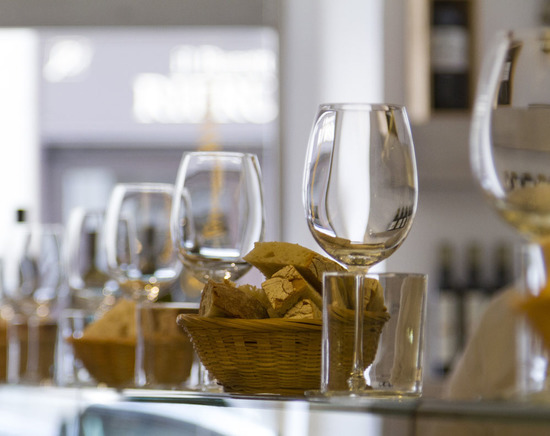 Their wine list is extensive and with only a few seats in the salon, it is a chic oasis in the heart of Florence. Take a window seat and watch bustling Lungarno degli Acciaioli, with passers-by saddled on Vespas and bicycles, through floor-to-ceiling windows overlooking the Arno river. Located in the central west of Florence, Seidivino has an old world charm, set under a high arched brick ceiling with a long wooden bar offering stools to perch on. Dark wood shelves line the walls housing rows of a variety of Italian wine bottles, available by the glass or full bottle. If you prefer, there are a number of small tables for larger groups whilst still offering the cozy ambiance. Outside, old French oak barrique barrels are used as tables overlooking Borgo Ognissanti while come night, locals gather for the hearty and tasty aperitivo buffet from 7 pm. The upstairs of Florence’s historic Central Market has recently been overhauled, refurbished into a funky Italian food court offering an exciting array of food stands from fresh cheeses, wood-fired pizza to hand-rolled gnocchi. For wine lovers, Enoteca Chianti Classico is a Sangiovese specialist’s dream with 1,200 labels available to try by the glass or purchase by the bottle. Open daily, from 10am until midnight, you can speak with experts of these Black Rooster labels to find your perfect red wine in a fresh, modern setting under the arches of the 19th-century building. This rustic hole-in-the-wall venue is just a block from the Duomo and offers an authentic Italian experience. A weathered small wooden bar fills the ground floor room lined with wine bottles all being served by the glass. A cabinet of crostini is sold by the piece with the room decorated with old family photographs and the purple colours of Florence’s beloved soccer team. It’s a family run affair filled with locals and with inexpensive yet good wine sold from 3 euros a glass. Grab a glass of your favourite drop and perch on one of the small wooden stools out front or venture into the basement cellar where an Osteria menu is also served offering classic Tuscan dishes from ribollita (breaded soup) and antipasto of salumi (plate of an assortment of fresh salami meats).